Alex Kuizon covers his face as he stands near dead fish at a boat ramp in Bradenton Beach, Fla., Aug. 6, 2018. 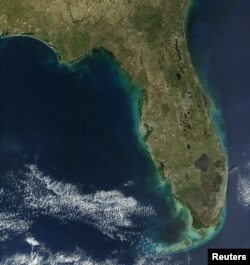 Scientists in Florida are on the cusp of developing promising methods to control toxic algae blooms like the “red tide” that has been killing marine life along a 150 mile (240 km) stretch of the Gulf Coast, the head of a leading marine lab said Wednesday. Michael Crosby, president and chief executive of the Mote Marine Laboratory in Sarasota, welcomed a red tide emergency order issued this week by Governor Rick Scott, designating more state money for research, cleanup and wildlife rescues. Interest in mitigation technologies has been heightened by a 10-month-long toxic algae bloom off Florida’s southwestern coast that has caused mounds of rotting fish to wash up on beaches from Tampa to Naples. Work crews clean up dead fish along Coquina Beach in Bradenton Beach, Fla., Aug. 6, 2018. The red tide also has been implicated in at least 266 sea turtle strandings and is suspected or determined to have caused 68 manatee deaths so far this year, according to Florida Fish and Wildlife Conservation Commission figures. In hopes of combating future outbreaks, scientists are field testing a patented process that would pump red-algae-tainted seawater into an ozone-treatment system and then pump the purified water back into the affected canal, cove or inlet, Crosby said. Experiments carried out in huge 25,000-gallon tanks succeeded in removing all traces of the algae and its toxins, with the water chemistry reverting to normal within 24 hours, he said. Scientists also are studying the possible use of naturally produced compounds from seaweed, parasitic algae and filter-feeding organisms that could be introduced to fight red tides. Red tides occur on an almost yearly basis off Florida, starting out in the Gulf of Mexico where swarms of microscopic algae cells called Karenia brevis feed on deep-sea nutrients and are sometimes carried by currents close to shore, usually in the fall. This year’s Gulf Coast Florida bloom is the worst in more than a decade, originating last October and persisting well into the summer tourist season while spreading across 150 miles of coastline spanning seven counties. “It’s a bad bloom by any standard,” said Richard Stumpf, an oceanographer who studies red tides for the National Oceanic and Atmospheric Administration (NOAA). For reasons not well understood, strong northerly winds that normally break up a red tide by December failed to materialize last winter, Stumpf said. It remains to be seen whether a single year of altered wind patterns will turn out to be an isolated deviation or part of more long-term changes in climate, Stumpf said. For humans, exposure can cause respiratory difficulties, burning eyes and skin irritation. The toxins are often fatal to marine life. The latest bloom coincided with the spawning season for snook, an ecologically important and popular game fish in Florida, Crosby said. A portion of emergency funding ordered by the governor is earmarked for assessing impacts on that fish.